HARP Fantasy is an epic fantasy role-playing game, written by John Duffield, Thom Jones, Sam Orton, and Marc Rosen and published by Iron Crown Enterprises. 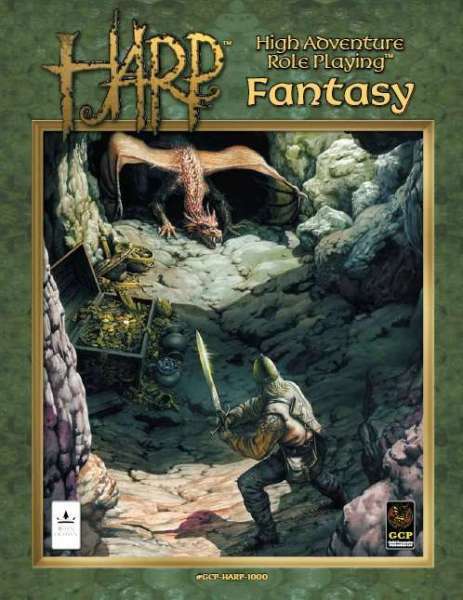 HARP Fantasy is an epic fantasy role-playing game system powered by the High Adventure Role Playing (HARP) mechanics from Iron Crown Enterprises. Although HARP is a d100 system, it is quite unlike the typical d100 system. Instead of a roll-under mechanic whereas your skill defines the target number, it is more like what d20 OGL would look like if you used d100 instead of a d20. For example, Character Stats area a value that translates into a bonus, as opposed to a value that is added to another value to create a base skill value. One of the biggest changes, however, from most d100 systems is that HARP is a roll-over system; not a roll-under system. The HA in HARP means High Adventure. That’s a pretty big tag to carry as High Adventure signifies great, heroic deeds, plenty of action, and likely memorable adventures. The interesting thing is, when you look at the mechanics, they embrace the heroic style of high adventure in a sense of “go big or don’t go at all”. Characters are designed with certain stats significant enough to perform these heroic deeds. All other stats are not meant for heroic deeds, but they can be useful for utility purposes. Thus, your PC is designed to do amazing things and his or her stats will aid you in your d100 rolls. Just make sure you are thinking strategically; when it’s “all or nothing” (fail or success, no grey areas), you better have the right stats or tools. But when you do, amazing feats of role-playing can occur. To me, that sounds like High Adventure. Getting back to the idea of d20 OGL using d100, HARP takes the fantasy genre and adds a level of granularity common to d100 systems. You have a greater range of penalties and bonuses to differentiate between races, cultures, and professions (+1/+2 versus +5/+10/+15/+20) and a larger collection of skills with baseline values calculated from your main stats. There are many rules-medium systems that go with a much-abridged list of skills, but HARP Fantasy sticks to a larger list of skills common to d100 systems. One disadvantage of fewer skills is that characters often feel alike from one to another at higher levels. “Oh, all five PCs have the exact same 10 Skills and only one that the others don’t have.” That type of occurrence is much more rare when you have more skills to choose from, hopefully without suffering from skill bloating (i.e. having way too many skills in a game system). Characters have unique abilities because there are simply more skills to choose from and more ways to create the unique character concept. Magic in HARP Fantasy is quite unlike d20 OGL. In fact, it’s more like a rules-medium or d100 system whereas you have fewer spells to choose from, but those spells are scaleable (unlike d20 where you have to acquire 5 different Healing spells as you progress in rank). Although it’s a personal preference, I like scaleable magic that doesn’t require you to acquire the same spells, just at different levels, over and over again. Those are really the major aspects of HARP Fantasy that set it apart from other gaming systems. Like most fantasy gaming systems, it covers a host of common aspects including races, professions, combat, equipment, poisons, treasure, monsters, and gamemastering. It’s all there though, making it an all-in-one core rulebook. HARP Fantasy is definitely a unique system. It has the feel of d20 for those who don’t like to stray from d20 OGL, but utilizes d100 with added granularity. It also makes your character much more heroic at the things he or she is good at, embracing that high adventure aspect. For those who like d100, this adds a new flair of heroism whereas many d100 systems are a bit more gritty and exhibit deadly combat. Again, embracing that high adventure aspect!